As host I was able to pick first. So I picked the Holy Roman Empire and, as usual, renamed it into Straland. One of my first two techs was Mysticism. 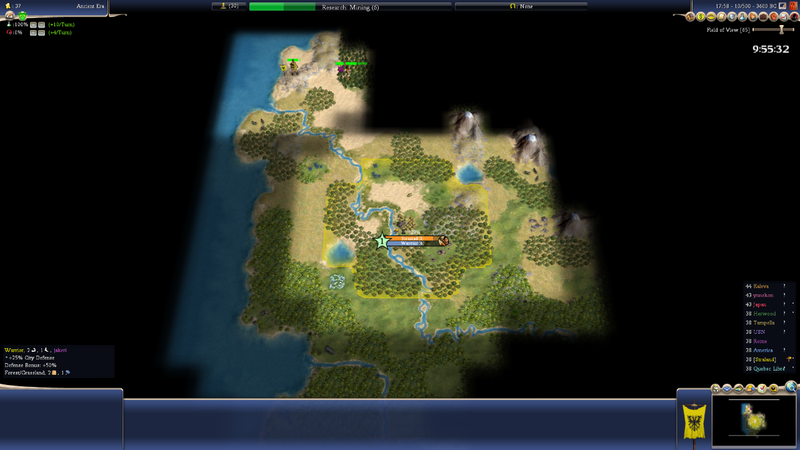 And I have a gem resource at a river there, which generates two commerce already. So I'm going for Meditation. Hard to imagine I won't be the first to get it and pick a religion. The river flows northwards, so I guess I should go there if I want to find water. But I'd rather jump from hill to hill first. Last edited by Matrix; 18-02-2019 at 22:57. I decided to do some extensive micromanaging and don't want to spend a single point on research too much if I can get growth for it in return. But there's something odd going on. Or perhaps not. 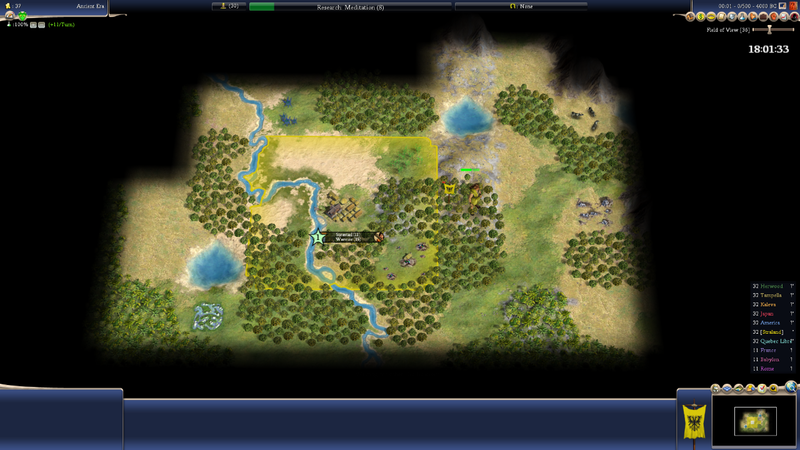 I'm getting 11 commerce per turn now: 8 from the palace, 1 from the city centre tile and 2 from the gem. I'm on 100% science of course. Yet the last two turns I've received 14 science points per turn and am on 28/112 for Meditation. Where are the extra 3 coming from? Is it because we're all on noble difficulty? It's probably a 25% bonus (11 * 1.25 = 13.75 ~ 14). I got my religion , next turn Strastad grows and then I'll make sure the warrior is done the turn after. Next is a scout, then a worker. And I met my fellow Finnish Pirate Party member! I have very close neighbours! Vili and Sami are also very close to each other, because they told me in real life. That's actually possible in this game. As you can see, jakeri, socralynnek and I are very close to each other. Especially them. Socralynnek said he agreed on peace (for the time being) with jakeri and hopes for the same with me. But he's Babylon and has bowmen (archers +50% vs melee). So I told him I'm gonna build myself some archers anyway. 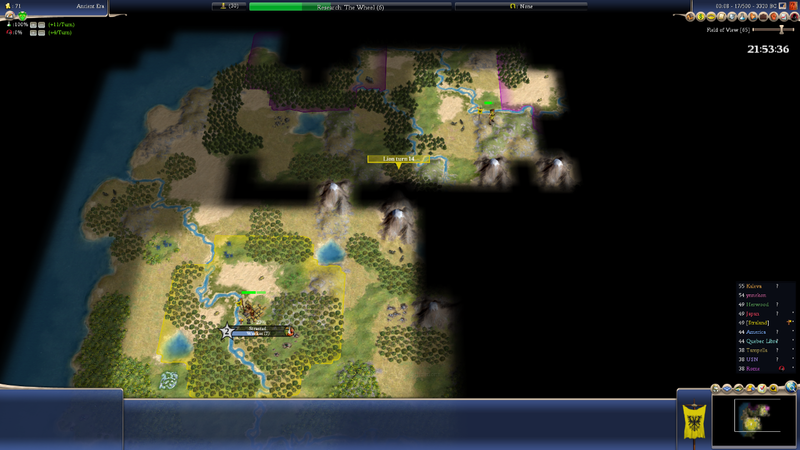 My starting position is really lovely, by the way. The mine on the gems booted my science by 57% (from 11 to 17; now 18), and now I'm building a farm on the corn. After that a mine for production (archers!) and then cottages. 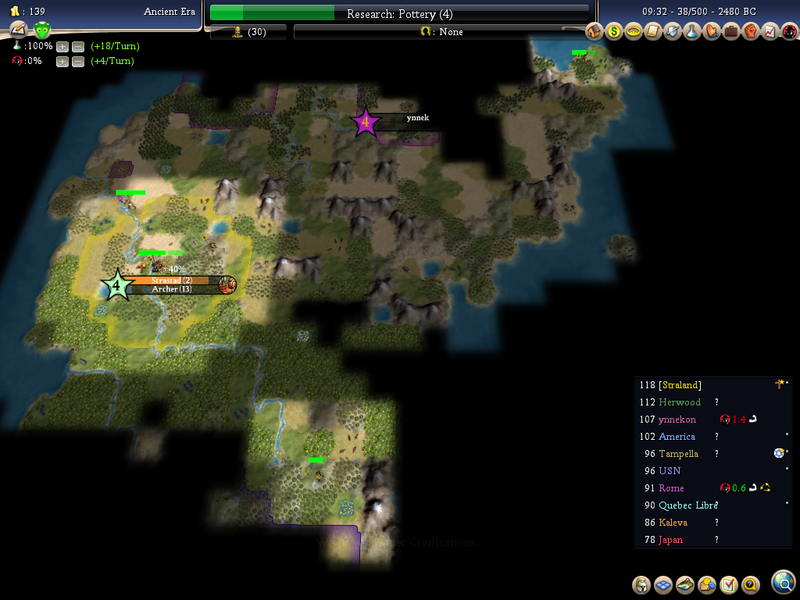 With the religion and gems, happiness will allow my capital to grow to size 7 already. Who made the map, or is it random? It's random. And yea, later on I realised we used to let other people make the map. We'll see how this unfolds. Those two have been very curt in their replies. I suspect collaboration. 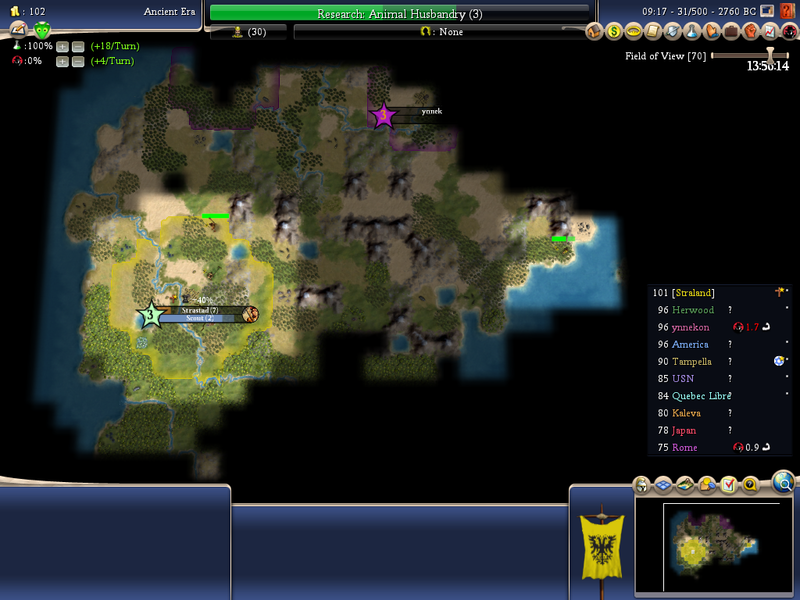 Okay, socralynnek convinced me he does not want to attack anyone early on in the game. And jakeri is just curt because he's Finnish. I can develop peacefully for a while. I met Lt. 'Killer' M.! The contours of the continent are also starting to emerge. Jakeri and Killer both have their second city. I'll build a settler once I have bronze working, which I will research after pottery.